We had our local town festival today. In a town of 800 people, it's really more like a family reunion. Of course, some folks drop in from town (the county seat) and around, so the population probably triples here on festival day. One of the big draws today was the Funnel Cake booth. It's hard to beat a funnel cake after a good plate of barbecue. But, these were extra special funnel cakes. Instead of the usual fried dough with powdered sugar (yum), you could top these off with all kinds of fruit and with cinnamon. 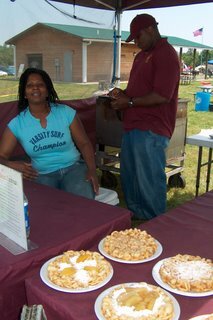 I must confess that we hit the funnel cakes BEFORE the barbeque. I'm as bad as the kids. Life is short, and dessert is a necessity and not a luxury. Bernadine was manning the fryer, and we got to chat a bit. She told me that they had driven down from Kings Mountain, North Carolina. Someone gave them "back road" directions, so they ended up out in the middle of nowhere. Of course, this town is the middle of nowhere too. But, they were in the wrong nowhere. In any case, someone helped, and they managed to make it over. Shawn is the owner, and he's in the background in the photo. Shy guy he is. That's OK. He has a great product and a friendly front gal. If he wants to duck and run when the camera comes out, then that's fine. My boys do the same. If you're looking for traveling food vendors, then check out The World's Best Funnel Cake. Yep. They really have a web site. That's rather the exception at small town festivals. I'm glad they came out and gave us a look and a taste of the funnel cakes. Hopefully, they'll be back next year.